One of the things that the act of recycling addresses is the lamp recycling. Especially when it concerns the lamps that contain mercury – no matter how small it is in these lamps (less than 4 mg) – it is very important to separate the lamp wastes from the other household/industry wastes. Read on and you’ll find out why lamp recycling is essential to protect our health and how we can recycle lamps properly. Why should we do lamp recycling? The lamps meant here are the mercury-containing lamps. These include the Fluorescent, Compact Fluorescent Lamps (CFL), and High Intensity Discharge Lamps. There is only a very small amount of mercury inside these light sources, and it’s even smaller when they’re at the end of their lives, but even the smallest amount of mercury when disposed improperly could endanger human’s health. That’s why we have to separate these mercury containing lights and send them off to the lamp recycling centers. How is Mercury dangerous for our health? Mercury is identified with Hg symbol. It is a heavy silvery metal which becomes liquid at room temperature. Exposure to mercury can cause a man to experience health problems, from the light to the more acute ones. When a body is contaminated with mercury, some stay in the kidney while some others travel throughout the body. It may be in one’s blood, brain, bones, liver, etc. As this exposure gets intense, the body can experience irritability, hallucinations, insomnia, brain damages, and many more. How do we properly recycle lamps? Simple. Don’t throw away broken lamps together with the other wastes. Keep them in a separate container until it’s time for you to transfer the container of these lamps to the recycling center. 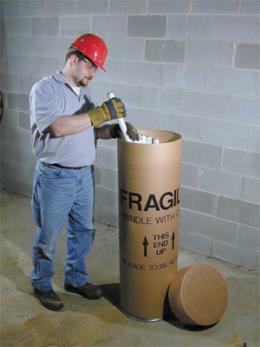 A good idea is to use fiber drums, made especially for containing fluorescent lamps for recycling purposes. These recycled drums are reusable, environmentally friendly, cost effective, moisture resistant, and most importantly they are an important tool towards the better, healthier environment. Contain your broken fluorescent in these drums and take them to the recycling center to further process the mercury. Sending mercury containing lamps to the recycling center recovers 99.98 percent of the mercury in the lamp. This way you can reduce your electricity bill by using energy-saving fluorescent lamps while still act responsibly as the lamps come to the end of their lives.